A few months back, I’m lying in bed very early one morning. Sunlight is just starting to seep into our bedroom. Christine is still asleep as l silently check my messages in stealth mode so I don’t wake her. I check my mail and socials then search my favorite news and come across a story about a book on negotiation written by a former FBI negotiator. I start reading excerpts of Stalling for Time by Gary Noesner and the idea hits me that his negotiation tips and strategies would be of interest to real estate agent listeners of my weekly podcast. I quickly find Gary’s website and send him a message inviting him to be a guest on my show. A couple of minutes later, a fresh email blinks up on my iPhone. It’s Gary saying no worries. He’d love to be a guest on my show. Crazy! All this happened before I even get out of bed! Within a week, my interview with Gary is recorded, edited, produced and live on iTunes and Stitcher. Within 2 weeks, it’s had thousands of downloads and I have hundreds of new subscribers to my podcast and signups to my email list. All because I woke up early one morning and I have a podcast. The world of podcasting is now mainstream and gaining serious momentum. It’s not hard to see why. I’m just one person with some acquired skills and a global market. Is it really that straightforward? Actually it is. When I owned my real estate business, my network was my net worth. Now that I have transferred the skills I learned from that business to marketing, nothing has changed. By regularly connecting with people who like my content, I’m building new relationships daily. Already these new contacts are becoming personal coaching clients, purchasing products I offer like websites and marketing tools and signing up to use the awesome cloud-based real estate software I have developed with some partners. Releasing relevant and valuable content on a weekly basis is good for business and I feel more connected with my people than ever before. If I were in real estate today, I would get a podcast up and going ASAP and interview the influencers in my community like the school principal, the mayor, sporting coaches, business leaders, financial planners, builders, members of parliament, top sports people in the area, the fire chief and high-profile volunteers. Think about it: the sky is the limit. Imagine how your personal brand will be boosted simply because of your association with local community leaders and influencers. I would name my podcast for my community (not myself of my company) and engage local residents with relevant and interesting content. Then guess what happens next? The people you interview will share your interview with their connections and Facebook friends. Chances are it would have been near impossible to get time with these people, but because you have a podcast, you’re in like Flynn. And that’s where the real magic happens. It’s like having your own radio show but for a fraction of the cost and completely on your terms. 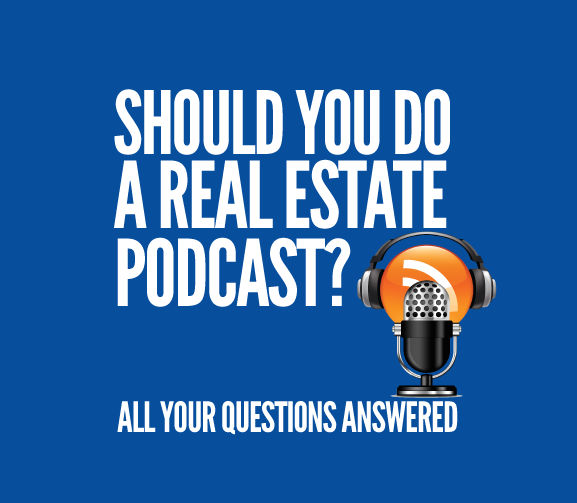 If you’re seriously considering a podcast, message me and I tell you how I’m helping agents get set up to clean up using podcasting. When I email my list to let them know about a new episode or blog, I’m communicating with them directly unlike platforms like Twitter or Facebook which can be often hit and miss or subject to algorithm changes on a whim that threaten marketers on a daily basis. 3. I own the content. The material I produce is mine to keep and leverage how I want. Apart from my own time, set up, storage and production costs, I don’t pay for anything either now or in the future. I consider it an asset that continually accumulates to be worth more. When I record and episode or write a blog, it’s there for keeps and working for me 24 hours a day. I’m careful to update any tech blogs I write that might become outdated. I accept, understand and support the fact that people (my people) are relying on me for current and relevant information that is increasingly important to their personal success. When you uploaded a video to Vimeo or Youtube, there’s no telling how it will be consumed and with how much success. But a podcast is different. Because it’s just audio, it is way easier to deliver and can be listened to by more people in more places and situations like the car, walking the dog, gym or riding the subway. And because the listener only has to worry about the volume button, it’s still simpler for them to tune in and really listen to your message. Ultimately, I learned most of what I know about podcasting by listening to other podcasts but that took me a long time. If you’d like to find out all about the short cuts, let me know. How I used podcasting to reinvent my career. I started listening to podcasts well before I thought about creating one of my own. Finally, here was the technology to access the content I wanted to consume, when I wanted to consume it. Today there is such a wide range of topics to choose from, so diving deep to find out more has never been easier. In the old economy, there was little listening choice. My commutes were essentially station surfing sessions hoping, no make that praying, to be engaged. These days, our cup runneth over with so many awesome choices that the issue has become; what do I listen to? As a marketing guy, I’m always looking for new and different ways to connect so it wasn’t long before I started to consider setting up my own podcast so I could be part of this new wave and engage my own group. Leaving Australia and starting a new life in Canada in my early fifties presented it’s own set of challenges. My field of expertise is helping residential real estate agents grow their brand and their business by leveraging technology and innovative ideas. I’m a fan of taking relationship-marketing strategies to the next level, which is where I enjoyed my own success for many years. I worked hard to establish a large contact base of potential clients and built a reputation as someone who thought a little differently. But in North America, I was unknown and the real estate marketing and coaching scene is full of established names who have been around for years, but essentially offering the same old material. When I started to warm up on the podcasting idea, I began listening to podcasts about podcasting. The surface information was informative and I learned a lot but getting the real information I needed meant signing up for courses. I knew how to record on Garageband and save it as an Mp3 file, but where to from there? It was almost like podcasting was this secret society. If so what and how do I accurately target potential listeners? How do I record my interviews over the phone? What kind of website should I set up? Where do I host the episodes? Which host is the most affordable and which host allows you to find out how many times and episode has been downloaded? How do I get set up with iTunes? Do I need to be on Sticher and Soundcloud as well? Do I need a blog with each episode? How do I set it up so when I post my podcast, it is automatically distributed to the major podcasting channels? How do I tidy up my edited audio file so the sound levels are even. Getting set up with the right equipment was a nightmare. Each expert I consulted had a completely different set of equipment recommendations. Some said you need a great microphone others said a $40 mic would work fine as long as you have the something or other filter and pre-amp condenser thingamigig. So I figured I would get started with what I knew and discover what I didn’t along the way. I began booking appointments with interview guests and that forced me to make decisions. I learned that many wannabe podcasters record one or two episodes then never do another one. They call this podfade. I made the commitment there and then that if I was going to go to the trouble of getting set up and invest time and effort into creating a podcast show, I was going to be in for the long haul. Starting and stopping would send a message to my people that I couldn’t follow through and that’s not how I roll. I read somewhere that it’s best to hit the ground running with at least 5 podcasts. That way you have a more credible presence in the podcasting space and stand a better chance of ranking higher in your category on iTunes. Also, the more episodes you have live, the better your chance to attract speakers. I’ve been going almost a year and averaged a podcast each week. Right now I do it all myself. From finding the right people to interview to editing the show and creating the artwork for the shownotes and Facebook posts, I’m a one-man content creating and production company. The time investment for each episode is about a day but the payoff has been enormous. I set up a free giveaway on the front page of my website (TopAgentsPlaybook.com) and right from day one, I started attracting new followers. One of the things I really love about podcasts is that you get to control your list of contacts and in my world, your list is everything. Within a couple of months, I started to receive messages from agents looking for coaching so I decided to set up a private coaching product and within a month, my coaching roster was full. I was careful to take on people I enjoyed hanging out with. I looked for tech savvy agents who were serious about building their personal brand. Without exception, all of these coaching clients connected with me because of my podcast. I like to give away lots of quality content so people get the chance to try my ideas and see how well they work. As the number of podcasts grew, I started to approach higher profile guests which helped drive more and more traffic to my website. To me, a podcast episode is like planting a tree that will always bear delicious fruit. Get started today and watch what happens! ← Morning Power. How to leverage your most important high energy hours of the day and get stuff done.